Audio Shows and Fairs only really began in the United Kingdom at the end of the 1950's. This was approximately at the same time as the magazine Hi Fi News appeared. During the 1940's and 1950's Armstrong frequently went to the ‘radio’ shows held each year in London. However by the early 1960's they became regular attendees at the Audio Shows. The photo shows Ron Sheppard to the right, with an unidentified woman beside him. Although above the image is too small to show the details, a full-sized copy of the photo allows the notices on the walls of the stand to be read. The one on the left indicates that the PCU27 is being displayed for the first time at this show, so the date of the picture is probably either 1959 or 1960. However it is not currently known exactly when or where the photo was taken. 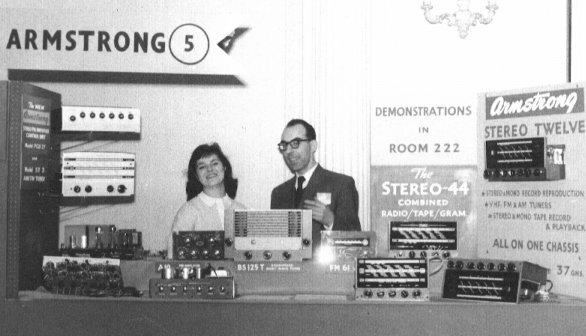 At the 1962 International Audio Festival and Fair, held at the Hotel Russell in London on April 26th - 29th Armstrong had both a ground-floor display stand (number 9) and a demonstration room (number 359 on the 3rd floor). This combination of display stand and demonstration room became the standard procedure each year at the shows. From the 200 range onwards, new ranges and products were routinely unveiled at the London shows. During the 1960's the company developed a reputation for superb ‘automated’ demonstrations. This in an era long before computer-controlled audio-visual experiences! The above shows a view of a typical Armstrong demonstration system at a Show. Each of the units in the Armstrong range was on display. Here the 500 range is featured in the display used for the 1972 show. 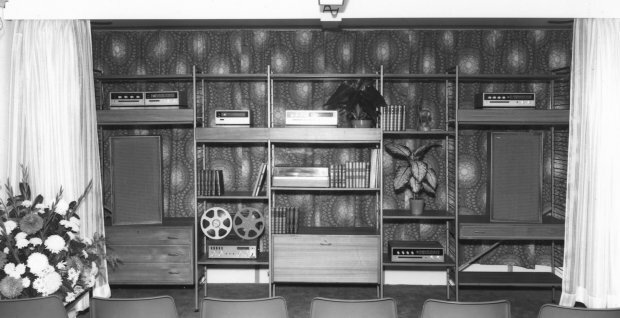 The entire demonstration was controlled and driven by a Revox A77HS tape recorder. From 1969 until the start of the 1980's the demonstrations were entirely on reel-to-reel tape at a tape speed of 15ips. The 1968 and earlier shows used 7.5ips tape mixed with LP. 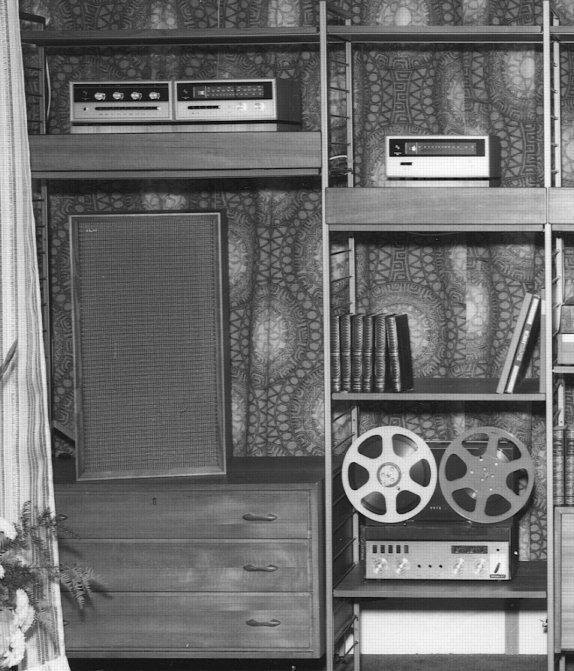 In 1967 demonstrations of ‘live’ stereo radio were also included in order to show off the performance of the tuners and stereo multiplex decoders. However there were two problems with stereo radio in those days. Firstly, stereo transmissions were then still quite rare, so most of the time during a show no actual stereo transmissions were being made. Secondly, the broadcasts were initially limited to Radio 3, and hence when transmissions did coincide with a show, their content often didn't appeal to all customers who wanted to hear a demonstration. The use of LP was also problematic in the 1960's and 1970's as the discs were prone to wear or damage, so rapidly deteriorated when played every 15 to 20 minutes. Hence they didn't always show off the equipment to best advantage! This problem also affected some early show tapes to some extent as it was hard to find LPs that were in demonstration condition. This problem only eased in the 1970's when Barrie Hope of Armstrong finally persuaded EMI to loan him master tapes for copying in order to include them as examples in the demonstrations. The automated demonstrations were based upon using lengths of recorded magnetic, tape spliced together with short pieces of translucent leader in between the sections of the programme. The tape deck was fitted with an opto-sensor arranged so that when a transparent section was played light was sensed and this could trigger a switch. The output from the opto-sensor was fed to an electromechanical rotary switch that stepped around one position each time a transparent section was detected. The arrangement was then wired up to a complex set of other switches, motors, etc, which were operated as the demonstration proceeded in a sequence determined by the wiring details . A typical demonstration would begin with the curtains opening and either an announcer or an initial item of music playing. While each section of the programme was played, a light would come on to illuminate the relevant unit, and the inputs and outputs switched so that the indicated unit was being used to play that section of music or announcement. The announcements would then explain what was happening, identify which unit was to be featured next, and give technical information like the power output, etc, of the units. The programme was designed to be both entertaining and informative. The quality of the sound reproduction was generally very impressive, and usually had a distinct impact on many members of the audience. The demonstrations were typically around 15 to 20 minutes in duration. The tape would then be re-wound for the next demonstration, with a pause of a few minutes to allow one audience to depart and a fresh one to enter and take a seat.